End of Night excerpt: It is nearly impossible to find natural darkness. It is nearly impossible to find natural darkness today. 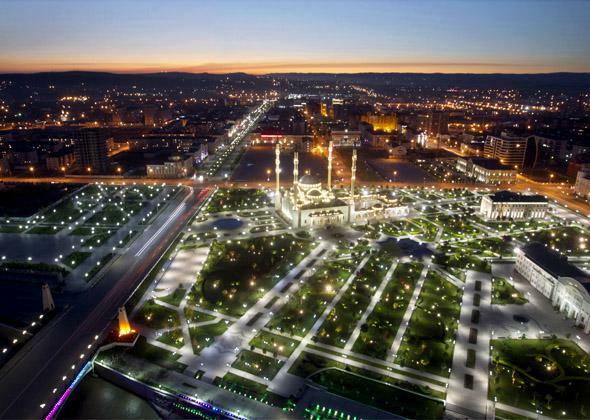 An aerial view shows the center of the Chechen capital Grozny, April 29, 2013. Imagine leaning out your door and, on the darkest nights, not being able to see more than a few feet in any direction. We’ve been to the moon and just about everywhere on Earth. So what’s left to discover? In September, Future Tense is publishing a series of articles in response to the question, “Is exploration dead?” Read more about modern-day exploration of the sea, space, land, and more unexpected areas. I sometimes try to imagine living in a city before electricity. How quiet pre-electric nights would have been without cars or trucks or taxis, without any internal combustion engines at all. No radios, televisions, or computers. No cellphones, no headphones, nor anything to plug those headphones into if you had them. How deserted the city with most of the population locked inside their homes, the night left to fears of crime, sickness, and immorality, and best avoided if one could. Finally, and most strangely—the biggest difference from that time to ours—not one single, solitary electric light. In Brilliant, Jane Brox tells of how American farm families, after they first got electric light, would turn on all the lamps in their house and drive out a ways just to watch it glow. Who can blame them? To go from the stink and dark and danger of kerosene to the clean well-lighted place brought by electricity—at the speed of light, no less. I would back away to admire the view as well. But soon it will be the rare person in the Western world who hasn’t spent his or her entire life bathed in electric light, and no one will remember what night was like without it. In the United States, our bright nights began with the first electric streetlight in Cleveland, April 29, 1879. But it was in New York City that the “possibilities of nighttime lighting first entered American consciousness,” writes John A. Jackle in City Lights: Illuminating the American Night. “Once adopted there, its acceptance was assured almost everywhere.” Thomas Edison returned to New York after a trip in 1891 to Europe proclaiming, “Paris impresses me favorably as the city of beautiful prospects, but not as a city of lights. New York is far more impressive at night.” Broadway was always the first, always led the way. It was the city’s first street to be fully lit at night, first with whale oil lamps, then gas (1827), then finally electricity (1880). In a drawing from City Lights of Madison Square in 1881, arc lights on a tall pole shed light on an otherwise dark city scene of strolling couples, a horse-drawn carriage, telegraph poles and wires, and—in this famously windy part of the city—a man in the foreground who seems about to be blown over by the light as he crosses the street, cane in hand. By the 1890s, Broadway from 23rd Street to 34th Street was so brightly illuminated by electric billboards that people began calling it the Great White Way. These days, walking from lower Manhattan, it’s not until I get to 31st Street that I reach anything close to the bright white streetlights I had expected. Until then I’m in what feels, at least late on a summer Sunday, like a forgotten part of the city. With the theater district and advertising lights moved far up the street, the once bright Way is far more mild than Great, much less White than gray. 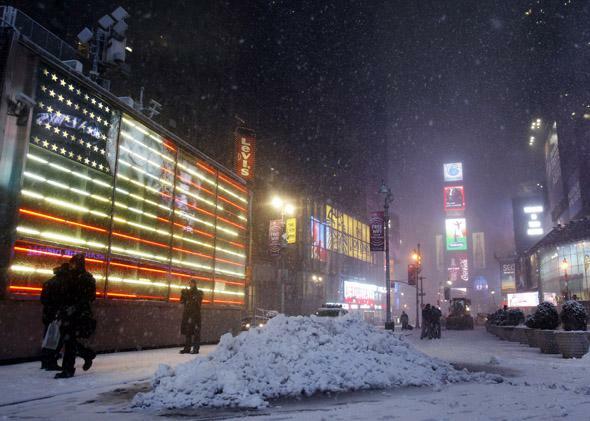 People walk through Times Square during a snowstorm in New York on Jan. 26, 2011. There is no night sky. But once in Times Square, all that changes. Flashing digital signs, billboards, colored lights—from 42nd to 47th is the brightest—and there is no night sky. I don’t mean I can’t see many stars, or even that I can’t see any stars, I mean there appears to be no sky. Yes, above me, there is a blackish color—but with no points of light or any other indication of being alive. Instead, I feel as though I’m in a domed stadium. The light from the digital billboards simply drowns the white streetlights that lower on Broadway seemed so bright. I can honestly say it feels as bright as day. Maybe a cloudy day, but day nonetheless. Certainly, it no longer feels like night. And by that I mean it no longer feels dark. In fact, at least in terms of darkness, “real night” no longer exists in New York City, or in Las Vegas, or in hundreds of cities across the world. According to the World Atlas of the Artificial Night Sky Brightness, created in 2001 by Italians Pierantonio Cinzano and Fabio Falchi, two-thirds of the world’s population—including 99 percent of people living in the continental United States and Western Europe—no longer experience a truly dark night, a night untouched by artificial electric light. 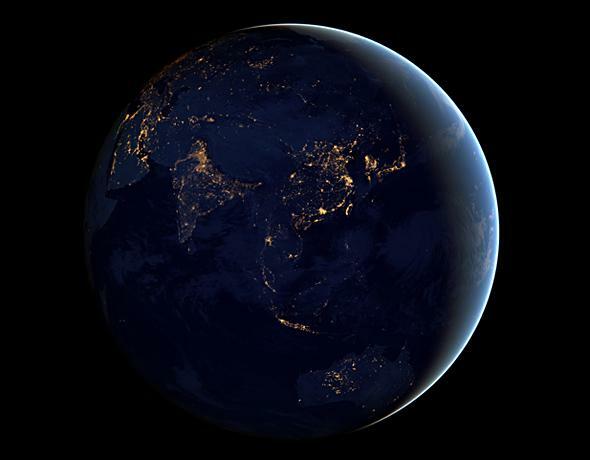 Satellite photographs of the Earth at night show the dramatic spread of electric light over the globe—even without a map to show political boundaries, many cities, rivers, coastlines, and country borders are easily identifiable. But as impressive as these photographs are, they don’t show the true extent of light pollution. Cinzano and Falchi took NASA data from the mid-1990s and, using computer calculations and imaging, showed that while in the photographs many areas outside cities appeared dark, they were actually flooded by pools of light spreading from the cities and towns around them. On the atlas, levels of brightness are indicated by color, with white the brightest, and descending from there: red-orange-yellow-green-purple-gray-black. Like the NASA photographs before it, the World Atlas of the Artificial Night Sky Brightness has a certain beauty, but in truth it is a tale of pollution. Light pollution is the reason Rob Lambert and I could see only a handful of stars from the Las Vegas Strip, and the reason I don’t see any stars from Times Square. It’s the reason why in the night skies under which the vast majority of us live, we can often count the stars we see on two hands (in the cities) or four (suburbs), rather than quickly losing count amid the more than 2,500 stars otherwise visible on a clear night. It’s the reason why even from the observatory deck of the Empire State Building we now see 1 percent of the stars those in 1700s-era Manhattan would have seen. The International Dark-Sky Association defines light pollution as “any adverse effect of artificial light, including sky glow, glare, light trespass, light clutter, decreased visibility at night, and energy waste.” Sky glow—on display nightly over any city of any size—is that pink-orange glow alighting the clouds. It’s tramping through a two-foot snowfall with the whole town bathed in push-pop orange. It’s that dome of light on the horizon ahead though the sign says you’ve still got 50 miles to go. Glare is that bright light shining in your eyes that you raise your hand to block. Trespass is light allowed to cross from one property onto another. It’s your neighbor’s security light shining through your bedroom window. It’s the lights on the brand-new science building that also illuminate the sororities across the street. It’s all over every neighborhood in America, land of the free and the home of property rights. And clutter? A catchword for the confused lighting shining this way and that in any and every modern city. The bad news? All mean wasted light, energy, and money. The good news? All are caused by poorly designed or installed light fixtures and our using more light than we need, and all could be significantly and—compared to other challenges we face—easily remedied. When I think of how light pollution keeps us from knowing real darkness, real night, I think of Henry David Thoreau wondering in 1856, “Is it not a maimed and imperfect nature that I am conversant with?” He was writing about the woods around Walden Pond and how the “nobler” animals such as wolf and moose had been killed or scared away. “I hear that it is but an imperfect copy that I possess,” he explained, “that my ancestors have torn out many of the first leaves and grandest passages, and mutilated it in many places. I should not like to think that some demigod had come before me and picked out some of the best of the stars.” Some 150 years later, this is exactly what we have allowed our lights to do. “I wish to know an entire heaven and an entire earth,” Thoreau concluded. Every time I read this I think, Me, too. Across the country from Walden and more than 150 years after Thoreau, Travis Longcore, and Catherine Rich have created the Urban Wildlands Group in Los Angeles. Dedicated to “the conservation of species, habitats, and ecological urban and urbanizing areas,” Urban Wildlands ranks light at night high on its list of concerns. 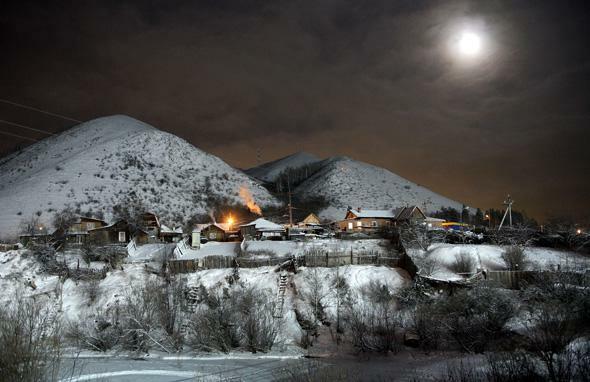 The moon shines above the Siberian village of Bazaikha near Krasnoyarsk, Jan. 2, 2007. Light at night impacts wildlife in five primary areas: orientation, predation, competition, reproduction, and circadian rhythms. With at least 30 percent of all vertebrates and more than 60 percent of all invertebrates worldwide nocturnal, and with many of the rest crepuscular, those implications are enormous. While most of us are inside and asleep, outside the night world is wide awake with matings, migrations, pollinations, and feeding—in short, the basic happenings that keep world biodiversity alive. Light pollution threatens this biodiversity by forcing sudden change on habits and patterns that have evolved to depend on light in the day and darkness at night. (In just one example, circadian photoreceptors—those same ones on which we humans rely—have been present in the vertebrate retina for at least 500 million years.) Aside from crazy-looking ancient fish and their bottom‑of‑the-ocean ecosystems (and those of caves or soil), every creature on this planet has evolved in bright days and dark nights. None has had the evolutionary time to adapt to the blitzkrieg of artificial light. Light at night impacts wildlife in five primary areas: orientation, predation, competition, reproduction, and circadian rhythms. If we have heard anything about light at night and wildlife, we’ve probably heard about orientation. This is the problem of insects drawn to streetlights, of migrating birds being attracted to lit‑up city buildings or communication tower lights, or of beach-born sea turtles heading the wrong way—toward streetlights and hotel signs—and ending up crushed by truck tires or plucked easily by predators. This image of Asia and Australia at night is a composite assembled from data acquired by the Suomi NPP satellite in April and October 2012. It was mapped over existing Blue Marble imagery of Earth to provide a realistic view of the planet. Less light on our roads, fewer streetlights and not so bright, is not only better for wildlife but safer for us—we drive slower and pay more attention when we have to rely on our headlights. But how to do with less light on our streets and highways? One innovative concept comes from a design cooperative in San Francisco called Civil Twilight. Their award-winning idea: streetlights that respond to moonlight, or “lunar-resonant streetlights.” Relying on LEDs and highly sensitive photosensors, they would allow the level of brightness from the streetlight to balance the level of light from the moon. On nights when there is no moon, or just a crescent, the streetlights would provide enough light for pedestrians and drivers. On full-moon nights, the streetlights would dim to barely on. Civil Twilight estimates that their idea could save more than three-quarters of the money spent on streetlights, as well as bring the ambience of moonlight back to our streets. The idea borrows from an old one. In the 18th and 19th centuries, street lighting was still intimately tied to the changes in seasonal light and the moon’s monthly phases. In Paris, even after the advent of gas lighting in the 1840s, two kinds of lanterns were used, one that burned all night, and another that was lit only when the moon in the streets didn’t offer enough light. Even into the early twentieth century, many municipalities planned their lighting schedules in relation to the moon. Long before Paris was the City of Light, it was, as every city in the world, a city of moonlight. Nobody who has not taken one can imagine the beauty of a walk through Rome by full moon. All details are swallowed up by the huge masses of light and shadow, and only the biggest and most general outlines are visible. We have just enjoyed three clear and glorious nights. … This is the kind of illumination by which to see the Pantheon, the Capitol, the square in front of St. Peter’s and many other large squares and streets. It’s an effect we no longer experience today. Too often in modern cities the moon, overwhelmed by artificial lights, makes its crossing unnoticed. And so we forget the wild beauty of this natural light, or worse: We never miss it because we have never had the chance to learn. Excerpted and adpated from The End of Night, by Paul Bogard, out now from Little, Brown.